Kooks Headers 34102401 - Kooks Dodge Durango SRT Longtube Headers 1-7/8" x 3"; 2018-2018. Since 1962, Kooks has had the reputation of making the highest quailty & best performing Custom Stainless Steel headers and exhaust systems. All Kooks Exhausts and Headers are handcrafted here in the USA! 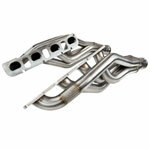 Kooks offers some of the highest quality headers and exhausts available here at LMPerformance.com. 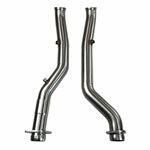 Kooks offers complete exhaust systems, from axle-backs to headers. Kooks also offers GREEN cats on most of their header applications. Kooks Green Cats are 49 State EPA Legal. California Residents: CARB WARNING: LMPerformance will not ship any products that are not CARB approved to California. This only affects CARB related products such that affect car performance and emissions where CARB approval is required. *** NOTE: Not legal for use on pollution-controlled motor vehicles. For off-road use only.The use of long tube headers with aftermarket cats, powerflo-x, h-pipe, x-pipe, crossover pipes with or without aftermarket cats or aftermarket cats are illegal for installation and use on emission-legal vehicles when operated on public streets or highways. They can only be legally used while participating in sanctioned motorsports racing events. Kooks Headers and Exhaust products are covered under our limited lifetime warranty. This warranty is limited to the repair or replacement of the product if the problem is due to faulty materials or workmanship. The warranty does not cover any coatings, polishing, painting, etc. and will NOT cover any re-coatings, re-polishing, or re-paintings to the headers. Kooks will not warranty any exhaust product that has been improperly installed, crashed, welded, or modified (coatings, header wraps, etc) in any way. Kooks will not cover damage to any related components. Neither the seller, nor Kooks, will be responsible or liable for any loss, damage or injury resulting from the direct or indirect use of this product or inability by the purchaser to determine proper use or application of this product. Kooks Headers and Exhaust products are built for off-highway use only and disclaim all liability for products used in racing activities and/or applications other than those specifically recommended in the current catalog. Claimed defective products must be returned with a Returned Merchandise Authorization (RMA) number to Kooks at the buyer’s expense. Products returned without an RMA number are subject to refusal. The returned product will need to include your name, address, daytime phone number, RMA number, and a copy of your sales receipt if available. Warranty will not be considered without a copy of your sales receipt. Upon receipt, Kooks Headers and Exhaust will, at its option, repair or replace the defective item. Kooks Headers and Exhaust Mufflers come with a 2 year limited replacement warranty. The muffler in question will need to have an Returned Merchandise Authorization (RMA) number and follow the same warranty return policy as stated above. Once the product is received by Kooks, it will be evaluated to determine the reason for failure. If cause of failure is determined to be impact damage, the claim will be denied. If it is a defective part that caused the failure, then the said muffler will be replaced and shipped back to the consumer at no charge. If it is determined to be an issue other than part failure, then we can offer a replacement muffler at a discounted rate. Vehicles equipped with a factory supercharger or turbocharger will only receive a warranty on Kooks Catalysts if they have the GREENCATS. There will be no warranty on our standard high flow catalyst if the vehicle comes equipped with a factory forced induction system. Furthermore, we recommend upgrading to the GREENCATS if your application will be producing more than 600 horsepower. GREENCATS can be installed on any of the Kooks exhaust systems. Example: A Ford Mustang GT500, which comes equipped with a supercharger from Ford, will only receive a Kooks-backed warranty if they are running the GREENCATS. 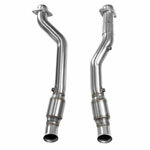 Kooks Headers and Exhaust EPA-Certified GREENCATS come with a 2-year limited replacement warranty. The standard High Flow Race Catalyst come with a 1-year limited replacement warranty. The catalyst in question will need to have a Returned Merchandise Authorization (RMA) number and follow the same warranty return policy as stated above. Once the product is received by Kooks, it will be evaluated to determine the reason for failure. If it is a defective part that caused the failure, then the said catalyst will be replaced and shipped back to the consumer at no charge. If it is determined to be an issue other than part failure, then we can offer a cat replacement program at a discounted rate. History and information about Kooks Headers and their products. Kooks Headers. Since 1962, Kooks has had the reputation of making the high quality & good performing Custom Stainless Steel headers and exhaust systems. All Kooks Exhausts and Headers are handcrafted here in the USA! Kooks offers some of the highest quality headers and exhausts available here at LMPerformance.com (along with Billy Boat, American Racing Headers, and Stainless Works Headers). 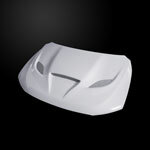 Kooks Headers and Exhaust offers production applications for many late model domestic automobiles. This means that you can get that custom header for your early or late model application for a fraction of the cost. There is no other header company in the country that can offer you a header for your gas engine truck, while still building handmade custom race headers that are used in applications making over 3,000 horsepower. KOOK&apos;s pride itself on being the pioneers in the stainless steel header revolution and have become the innovators in the exhaust industry as a whole. 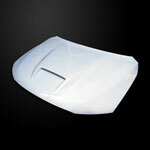 Kooks designs, tests, and manufacturers their products here in the USA. Don&apos;t forget to checkout American Racing Headers! Reviews for Kooks Headers's Other products are show below. Below are other popular parts other customers have purchased for their Dodge Durango. 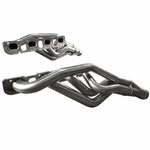 Kooks Dodge Durango SRT Longtube Headers 1-7/8" x 3"